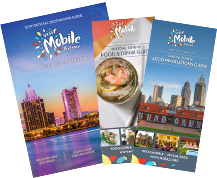 Being one of the oldest cities on the Gulf Coast, Mobile has always been able to offer visitors exciting, entertaining and educational experiences year-round. Translated: There are tons of fun things to do anytime you visit our historic, coastal town! You'll find museums and attractions showcasing everything from fine art to Mardi Gras, history to science, the military to mums. How about dancing in the street with thousands of new friends at one of the region's many outdoor music festivals, catching Moon Pies thrown from fire-breathing dragon floats during Mardi Gras or taking in millions of glittering holiday lights on a 65 acre historic garden estate? If water is more you're thing, you'll discover water-based adventures that bring you eye-to-eye with giant gators or have you shaking ‘fins' with gentle sting rays. Maybe you'll find yourself paddling toward an ancient Indian mound accessible only by water or sipping wine on a sunset cruise on Mobile Bay - after all, being on the water is simply a part of life around here. So, come, enjoy, engage, have fun! We Mobilians certainly do!